I first made these mini Ice Cream cones for my daughter’s 5th birthday over a year and a half ago. I think that they are so cute and so much easier than cutting full sized cones in half to get the get the right fit. For my Little Cup’s Birthday, we had a very last minute Ice Cream Party (in February) and these were made as the little thank you favors for all the little girls. The girls loved them! These minis were the perfect sized for the little hands. To make these little buggers, make your cake pop batter and then make small cake balls. I measured out regular size pops and then cut them in half. I used Chococones as the bases. 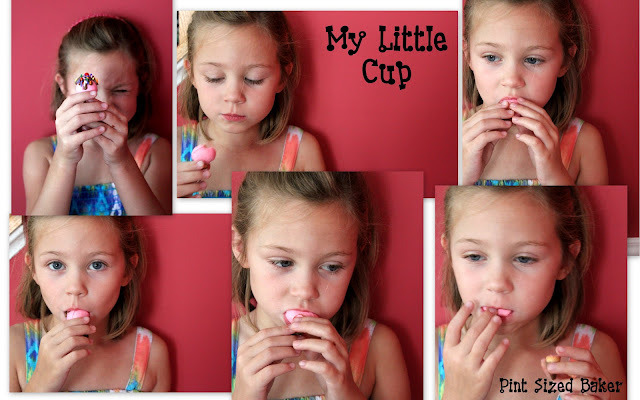 Have you seen these little candies?? They are little cookie dipped in chocolate. I love them! Dip the flat side of the cone and attach the cake ball. My cooling rack worked perfectly to hold the cones upright while I worked. Dip the pop and then decorate. I adding some “toppings” to my cones with some faux chocolate and marshmallow with sprinkles and a cherry on top. Didn’t they turn out perfect?? My Little Cup thought they did! She was a great help in the kitchen today. She even helped to take some pictures for me. I think the pops were the perfect reward for her. I’ve signed up with ReciPage and I am in the process of adding the past three months of recipes into the program. This will take a while for me, but the good news for you is that you will be able to print the recipe to take the kitchen and make. However, don’t hit the print button quite yet… Let me get a few more recipes in over the weekend and get the link up and live. Thanks for your patience. I’ll let you know when the page is live. You’ll also see a new Recipe Index Tab at the top of the menu bar. Combine Cake and Frosting in a mixer and combine. All frosting should be incorporated and cake should be thick and clump together. Step 1. 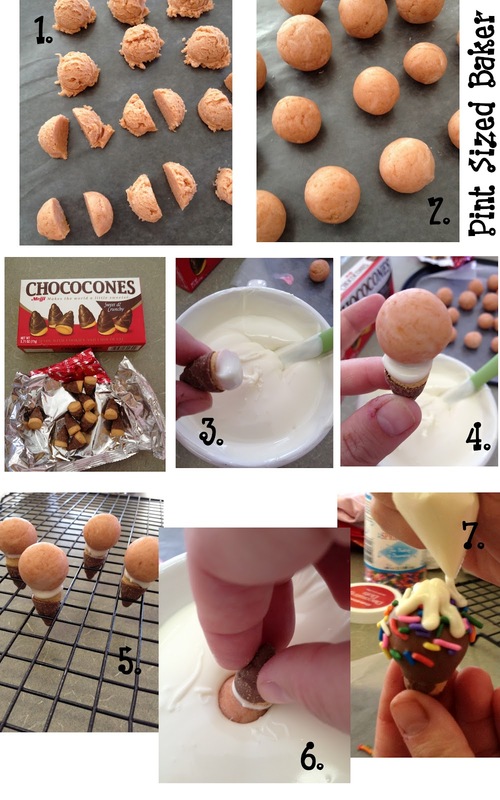 Form balls with cookie scoop and then cut them in HALF. Step 2. Roll the balls smooth and place them in the fridge while you melt your candy. You should have up to 24 mini cake balls. Melt your candy according to the instruction, being careful not to get it too hot. Open your box of Chococones. 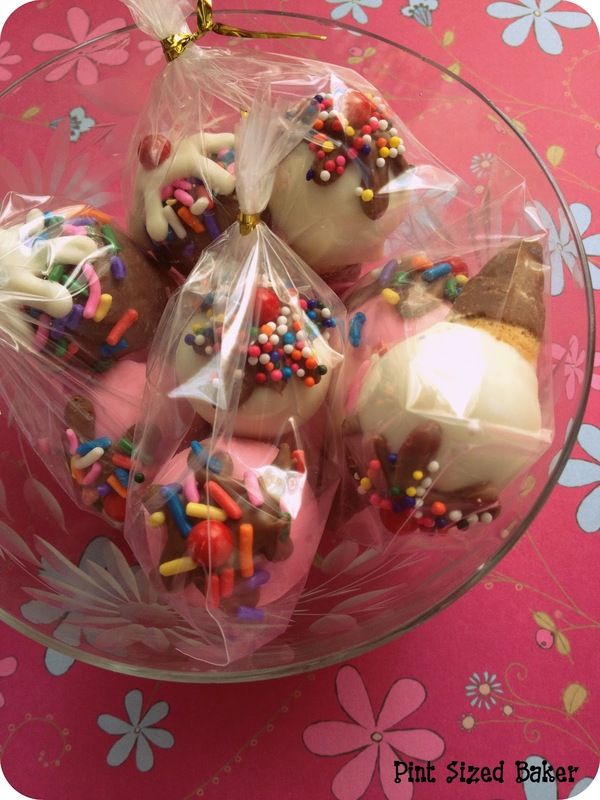 You might not have enough to make all of you cake balls, but you can always recombine them and dip some regular pops as well. Step 3. Add a drop of melted chocolate to the flat side of the cone. Step 4. 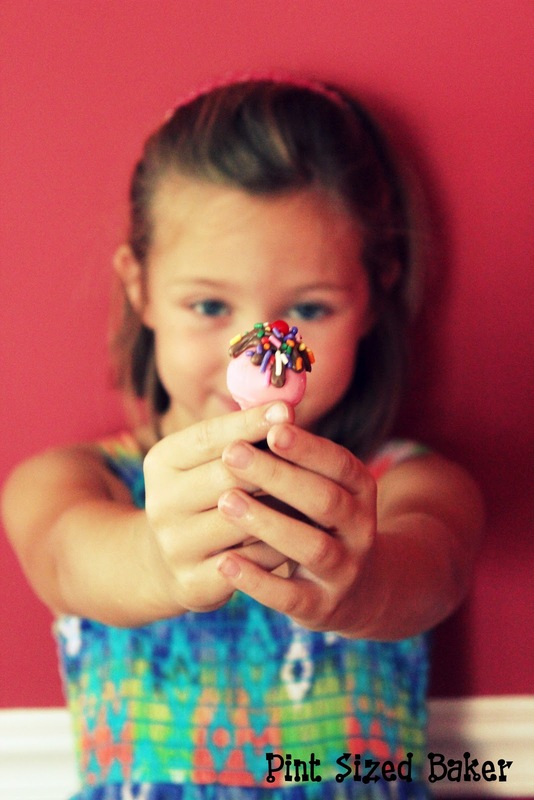 Attach a small cake ball. Step 5. Allow the candy to harden. My cooling rack is the perfect size to stand up these mini cones in. Step 6. Once all the pops are attached to the cones, dip them into the candy. You can add some sprinkles to the wet candy now, or wait to add them. It’s up to you. I added the jimmies on the chocolate cones prior to adding the white topping. Step 7. Place some white candy and chocolate candy into separate baggies cut a small hole in the corner. Pipe out a star shape on top of the cone and decorate. On the white and pink cones, I added the sprinkles to the topping then added a red “cherry” on top. Stand them up and allow to completely dry. Bag them up pretty to place into school lunches as a special treat. LOL, great minds think alike! 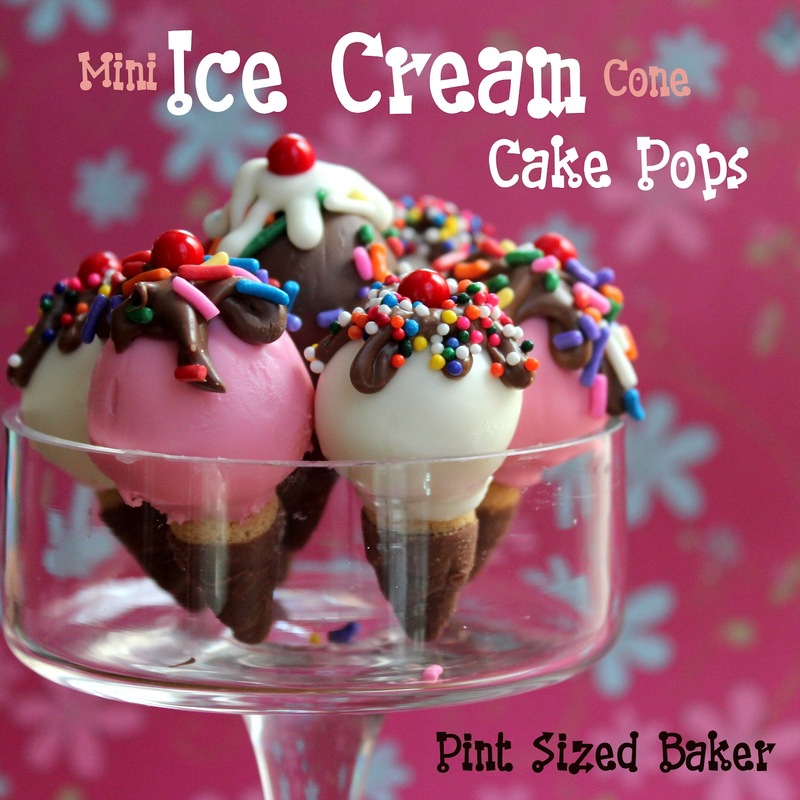 I found some mini cake cones recently and I had a very similar idea! You totally have more attention to detail and better pics than me though. Nice work! Very cute! Great idea for my sons birthday! They made a great party favor! Happy Birthday! 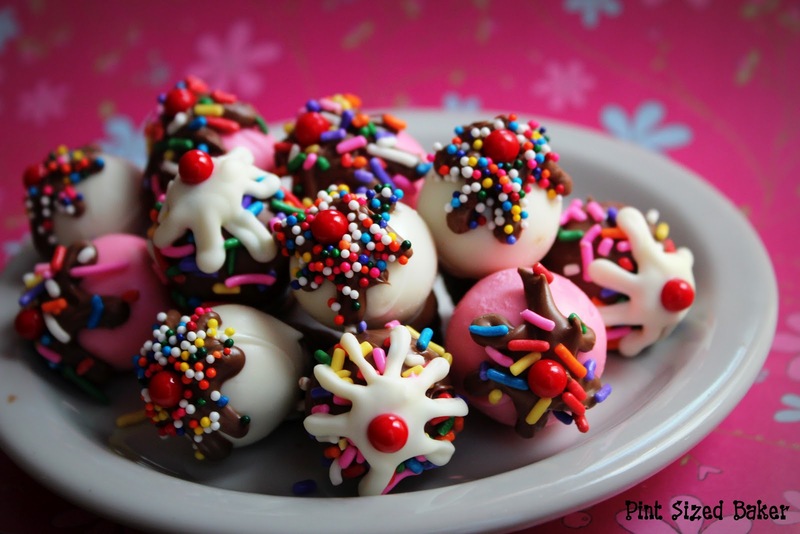 You are the queen of cake pops! These are adorable and I'm lovin the Chococones! love, love, love – what an adorable idea! I love these, they look so good! My little ones would love something like this, thanks for sharing! OH. MY. GOODNESS. These are the cutest things EVER, Karyn!! Probably one of my fave cakepops I've seen yet 🙂 I love those chococones and need to find some ASAP. Thanks, Hayley. These may be cute, but your dog is cuter! Woof! So, so cute! And tiny! Why is it that tiny things are always so cute? Cute idea! I would love for you link this up at my first LINK PARTY! These are so darn cute! I don't know if I've ever seen those little cones before. Now I'm on a search! These are adorable!! Very clever! 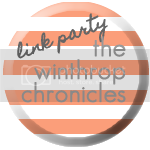 Found you through a linky party and would love to have you share these with my readers at http://www.thetaylor-house.com, Taylor house Thursday linky party. Oh Karyn, they are wonderful! I want to eat some up! Those are unbelievably adorable! I haven't seen choco cones but I'll be on the lookout for them now! These are absolutely adorable. I am most definitely making these. WOW! Your little one is just precious with those awesome Cake Pop's, these pops are really special! Hope you have a great weekend and thank you so much for sharing with Full Plate Thursday. My 7-year-old is going to love these! I've pinned them on Pinterest so that I have the recipe when her birthday comes around. Just wanted to invite you to come link up with Frugal Food Thursday at Frugal Follies! Hope to see you there! They look wonderful and I bet they tasted it too! These are Adorable! I have never seen those Chococones, where did you get them? 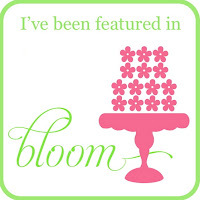 Thanks so much for linking up your amazing creations each week. Have a great week. Very cute!! They will make a huge impact on the guests. Funtique Parties is also a great resource if you're looking for help planning a birthday party.